Patient-specific quality assurance (PSQA) plays a vital role in assuring the accuracy and safety of the treatment process. The advent of commercially available software capable of estimating the dose delivered to the patient represents a paradigm shift in PSQA where the gamma index method is predominately used. This opens the possibility of evaluating a plan in terms of dose–volume histograms (DVHs), which offers additional meaningful information and assists with the decision-making process as to whether a plan should proceed to treatment. In this study, the practicality of introducing DVH metrics into the local PSQA protocol is investigated for volumetric-modulated arc therapy (VMAT) patients. VMAT is a complex treatment technique that provides highly conformal dose distributions with improved target volume coverage and sparing of normal tissues compared to three-dimensional (3D) conformal radiotherapy techniques. Treatment delivery involves the complex variation of multileaf collimator (MLC) leaf position, gantry rotation speed, and dose delivery rate, from a single arc, or multiple arcs depending on the complexity of the treatment. The treatment process can be separated into three major areas, comprising the treatment planning system (TPS), transfer of the plan from the TPS to the delivery system, and dose delivery. Errors arising in any of these areas may lead to undesirable consequences in the treatment. Thus, a comprehensive QA program should encompass all areas of the treatment process to ensure that the treatment plan is accurately delivered as intended, especially for complex techniques such as VMAT. This calls for a PSQA that is sufficiently sensitive to detect errors and issues that may occur in the treatment process, taking into consideration the desired level of accuracy and available local resources in the institution, and in accordance with national/international guidelines.,, A wide assortment of methods, equipment and analysis techniques are reported in the literature for PSQA of intensity-modulated treatment techniques. Point dose measurements made in a water-equivalent phantom are a reliable and practical technique that has found widespread use in PSQA, especially for intensity-modulated radiation therapy. Planar dose measurements utilizing radiochromic film or a detector array take this concept a step further by extending the number of dose points to two dimensions., The desire to estimate the dose to a 3D volume that better approximates the patient geometry may be achieved with gel dosimeters, although such methods are time-consuming and require significant resources to make it feasible in a busy clinical environment., In a similar way, 3D detector arrays allow the dose delivered to a volume to be estimated, outside the confines of a planar arrangement. The local VMAT PSQA protocol involves the use of two commonly used methods: ion chamber-based point dose measurements and 3D detector array measurements using the Sun Nuclear AC (Sun Nuclear Corp., Melbourne, FL). In both the cases, the patient plan is transferred to a phantom geometry and dose/dose distributions are calculated. Here, the gamma index method is used to evaluate the agreement between the measured and calculated dose at each point, and a single parameter known as the gamma passing rate (%GP) representing the overall proportion of points that satisfy the given acceptance criteria. Recently, it has been suggested that gamma index method is not sufficiently sensitive to detect clinically relevant patient dose errors using a widely used acceptance criteria (3%/3 mm).,, Coleman and Skourou investigated the impact of MLC positional errors on gamma passing rates for VMAT PSQA. Their study simulated MLC errors in prostate plans with measurements performed using the Sun Nuclear AC and the results analyzed in terms of %GP. The 3DVH software (described below) was used to estimate DVH metrics for the planning target volume (PTV) and organs at risk (OAR). They found the %GP is insensitive to MLC errors and there is a relatively weak correlation between the two methods. They concluded that the sole use of the gamma index for PSQA might be insufficient and a method for evaluating the dose delivered to the patient is required. Currently, there is a lack of consensus on the methods and analysis for PSQA of highly conformal treatments such as VMAT. While there have been many studies in recent years that advocate the use of DVH metrics, there is still no specific recommendations on how it can be implemented into a PSQA protocol. The 3DVH software is a commercial software application that allows the estimation of 3D delivered dose to the patient. It essentially uses the dose errors determined from the AC measurement in conjunction with the patient plan to perturb the original patient dose in order to estimate the dose delivered to the patient. This is accomplished using a sophisticated algorithm in the software known as planned dose perturbation. The result of this process is an estimate of the 3D dose delivered to the patient, thereby paving the way for identifying dose voxel errors with reference to patient anatomy and quantifying the magnitude of these errors in terms of DVH metrics. In this work, the practicality of introducing DVH metrics into an existing PSQA protocol is investigated for a cohort of HN and brain VMAT patients using 3DVH. Patient plans are retrospectively analyzed with 3DVH to identify cases where patient dose errors exceed the established action levels that were not originally detected by the point dose and gamma index method. Recommendations for any change to the existing protocol are explored based on these findings. PSQA results comprising point dose and %GP were retrospectively reviewed for 14 HN and 10 brain patients treated with VMAT between 2011 and 2014 in the local department. This cohort of patients represents all patients treated with this technique over this period. Patient plans were created in Pinnacle 3 v9.2 with SmartArc module (Philips Healthcare, Andover, MA, USA). Dose calculation was performed using the collapsed cone convolution algorithm and dose grid resolution set to 2 mm × 2 mm × 2 mm. The number of arcs in any given treatment plan ranged from 1 to 2. The size of PTVs in the HN and brain plans ranged between 24.4320–173.072 cm 3 and 52.26–361.8 cm 3, respectively. Similarly, the range of volumes for OAR analyzed for HN and brain plans was between 0.458–157.1 cm 3 and 0.0830–767.4 cm 3, respectively. Beam complexity can be inferred by the total number of monitor units, the latter of which increases with increasing number of MU. The total number of monitor units for the HN and brain plans ranged between 264–645 MU and 264–442 MU, respectively. The beams from the patient plan were exported to a plan that contains the computed tomography (CT) image of the AC, known as the “phantom plan.” The AC density was assigned a value of 1.15 g/cm 3. Dose calculation was performed for a single fraction, using the same parameters as in the original patient plan. Treatment delivery was performed on a Varian Clinac iX linear accelerator (Varian Medical Systems, Palo Alto, USA) equipped with the Millennium 120 leaf MLC and RapidArc installed. For point dose, an IBA CC13 cylindrical ionization chamber (IBA Dosimetry GmbH, Schwarzenbruck, Germany) was used to measure the dose at the center of the AC, which coincided with the linac isocenter. The chamber was placed in the CavityPlug™ using the manufacturer supplied Perspex chamber holder. The cumulative dose was measured for all arcs in the plan and compared to the dose calculated to the same point in the phantom plan. where the Dmeasured represents the dose measured with the ion chamber in the CavityPlug™ and DTPS represents the dose obtained from the phantom plan in Pinnacle 3. The action level established for %Ddiff was 3% was established based on recommendations in the literature. The point dose measured in the AC is performed separately to the measurement of the 3D dose distribution for analysis with the gamma index method. For 3D dose distribution measurement using the AC, the chamber holder insert was replaced with a solid PMMA rod, which ensures the AC cavity comprises a homogeneous density material. The AC absolute dose calibration and array calibration was initially performed before actual measurement. The composite dose resulting from all treatment arcs was acquired using the AC. All measurements were corrected for daily variations in linac output using a feature in SNC Patient v6.2 software. The measured and calculated composite dose distributions were compared in SNC Patient using the gamma index method using acceptance criteria of 3%/3 mm and 10% lower dose threshold and global normalization. Similarly, this was repeated using tighter acceptance criteria of 2%/2 mm. The lower dose threshold excludes dose points below a specified value for the calculation of gamma index. The output of this comparison is the gamma passing rate (%GP), which represents the proportion of points that pass the acceptance criteria. Under the existing protocol, a plan was considered acceptable if the point dose difference was within 3% and the %GP was above an action level of 95%. Plans that failed either one of these criterions would be investigated further to determine the cause of failure, which may involve repeating the measurement in the case of a setup error. For AC measurements, the measured dose distribution was compared to the corresponding TPS calculated dose distribution in SNC patient using the gamma index method, which produced the %GP metric. The estimated dose delivered to the patient was computed using 3DVH (v3.2). The required inputs are as follows: DICOM radiation therapy (RT) files for the patient plan (RT plan, RT dose, RT structures, CT images), phantom plan (RT plan, RT dose), and the AC measured movie lite file (ACML). The latter is automatically generated by SNC patient after the AC measurement and contains calculated gantry angles as a function of time. The AC-planned dose perturbation (AC-PDP) algorithm uses the above information to determine the presence and magnitude of dose errors to estimate the effect on the planned dose. DVHs from the estimated and planned dose were compared in 3DVH to assess plan quality. A more detailed description is given by Nelms et al. DVH metrics for target volumes and surrounding critical structures were evaluated in 3DVH by comparing the estimated dose to the corresponding planned values from the TPS. The median dose, D50%, was selected for reporting the dose to the PTV, as recommended by ICRU 83. OAR DVHs were evaluated using the mean dose, Dmean, or maximum dose, Dmax, according to the local clinical dose tolerances. Relevant OAR for the HN patients included the brainstem, parotids, mandible, optic nerve, optic chiasm, spinal cord, and oral cavity. Similarly, OAR selected for the brain patients including the brainstem, lens, optic nerve, optic chiasm, spinal cord, eye, and brain hemispheres. where D3DVH refers to the estimated dose from 3DVH and DTPS represents the dose obtained from the patient plan in Pinnacle 3. The action level established for %Ddiff PTV D50 was 5%, which considers the accuracy required to deliver dose to the target volume. For OAR, the absolute dose determined for a single fraction in 3DVH was multiplied by the total number of fractions to give the total dose to the OAR determined for the entire treatment. These values were compared to dose tolerances in the local departmental protocol to establish if it was within tolerance or whether further investigation was required. All patients were evaluated in terms of the relative point dose difference, %GP and DVH metrics for the PTV and associated OARs. The mean percentage difference between the point dose measured in the AC and the TPS calculated values was 1.51% and 1.04% for the HN and brain patients, respectively. The standard deviation of the mean was 0.81% and 0.94% for HN and brain patients, respectively. 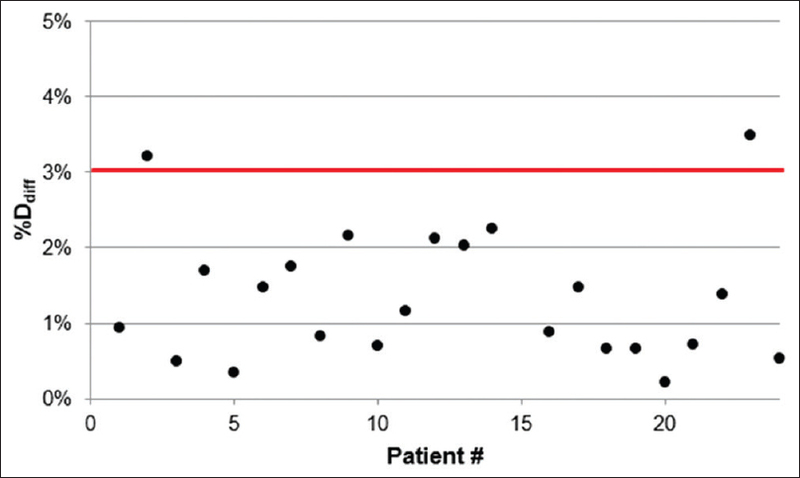 [Figure 1] shows a graph of the point dose results, where two cases are observed to exceed the action level of 3%. The mean %GP for 14 HN and 10 brain patients was 98.6 ± 1.8% and 98.3 ± 1.2%, respectively. All patients passed the gamma pass rate action level of >95%. Furthermore, to determine if this would increase the sensitivity to detect patient dose errors, the %GP was calculated using 2%/2 mm acceptance criteria. The mean %GP all patients was 92.6 ± 5.9% and 92.2 ± 4.0%, respectively. 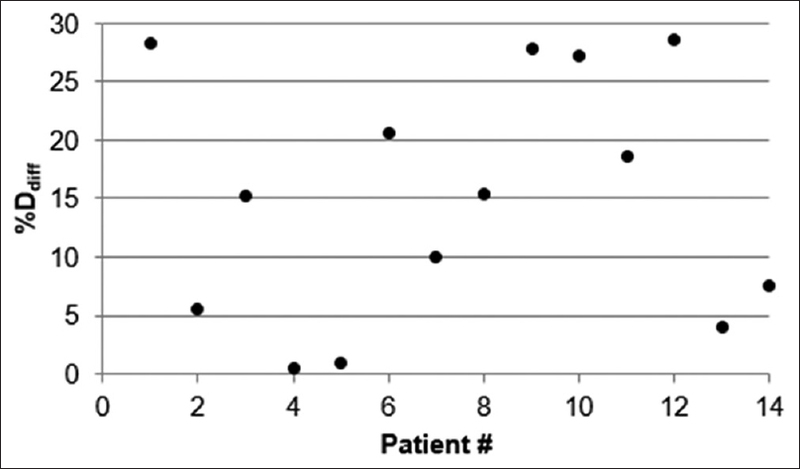 When considering individual patient cases, five HN patients and four brain patients did not pass the action level of >90%. The mean %GP and range determined for various treatment sites and acceptance criteria are shown in [Table 1]. The percentage dose difference was calculated for DVH metrics from 3DVH and the TPS. 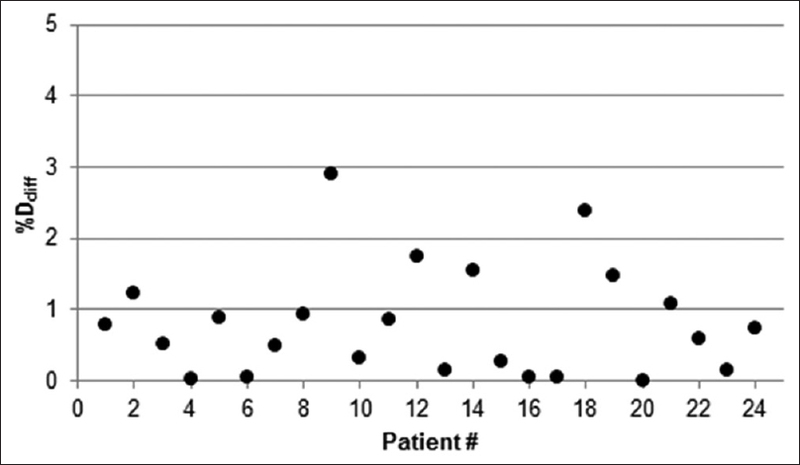 [Figure 2] shows a graph of %Ddiff PTV D50 values corresponding to each patient, which are all within the established action level of 5%. [Figure 3] presents an example of the %Ddiff of an OAR (L parotid) in all 14 HN cases. It can be seen that %Ddiff up to 30% in some of the cases. [Figure 4] presents an example of the %Ddiff of an OAR (optic chiasm) in all ten brain cases. The largest %Ddiff in these cases is above 4%. Examples of DVH metrics calculated for a single fraction in HN and brain case are shown in [Table 2] and [Table 3], respectively, to illustrate the type of information achievable with 3DVH. Each table contains the name of the structure contoured in the original patient plan, DVH metric, absolute dose reported by the TPS and 3DVH, and the dose error expressed in terms of absolute dose and relative dose. Cumulative DVHs curves for the TPS (reference) and estimated (comparison) data were computed in 3DVH to graphically depict the DVH differences in a familiar form. All 24 plans for HN and brain patients were retrospectively analyzed according to the established action levels in the PSQA protocol for point dose, %GP, and subsequently, evaluated using DVH metrics. In all but two cases, the point dose and %GP were within acceptable limits. 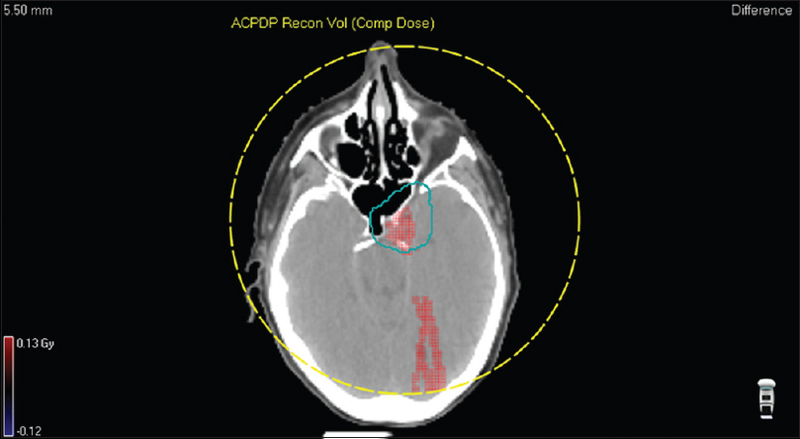 For the two failed cases, the point dose was above the action level of 3%, although the cause of failure was attributed to the presence of a high dose gradient across the chamber volume that could be observed from the phantom plan. In the institutional PSQA protocol, any failed result would be investigated by the physicist. The first step would typically involve checking the measurement setup was correct before investigating other contributing factors that may have caused the fault, including checking the chamber placement in the phantom plan. With the addition of 3DVH to the protocol, it was possible to determine the dose gradient and relative dose across the chamber volume without having to perform this task in the TPS. However, the placement of the chamber in the AC is restricted by the CavityPlug™ to the center of the device, which may be in a high-dose gradient and/or low-dose region. The accuracy of the AC-PDP algorithm to predict the dose delivered to patients has been validated for VMAT.,, 3DVH-computed DVH metrics for PTV D50% indicates all plans were within the action level of ± 5% in a similar manner to that of Coleman and Skourou. Finding an appropriate action level for %GP that can distinguish between good and bad plans remains one of the challenges of PSQA, which could be further supported by 3DVH. The relative dose differences in DVH metrics for OARs appeared to be exceptionally high in all cases, with a maximum observed dose difference of 50%. However, these errors were negligible in terms of absolute dose, with a maximum of 0.25 Gy observed, which explains the high relative dose differences. The use of relative dose difference for evaluating OAR DVHs are possibly misleading in such cases since it is influenced by the size and location of the structure, especially since OAR are typically located in low-dose regions blocked by the MLCs. Therefore, this protocol calls for evaluating OAR DVHs using absolute dose, which is currently performed in the local institution. In the cohort of patients studied, the OAR DVHs estimated by 3DVH were within the dose tolerances according to the department protocol. On the other hand, false negatives were not identified in this study but might be identified by increasing the patient cohort size and including treatment sites other than the ones investigated. A potentially powerful advantage of 3DVH over the other methods was the ability to visualize the presence of hot or cold dose voxels superimposed on the CT images so that the location of dose discrepancies can be viewed in relation to patient anatomy. An example of a case is shown in [Figure 5]. In four HN cases studied, a relatively large concentration of hot dose voxels is in approximately the same region of the plan. This may be attributed to the position of the movable couch bars on the Varian Exact treatment couch were in a different position during dose delivery compared to that of the phantom plan, and/or inaccuracies in the couch model. This error was possibly masked by the composite dose measurement with the AC and consequently not detected by the gamma index method. With the addition of 3DVH, the workflow for the PSQA protocol is shown in [Figure 6], where each test is performed in sequential order. For point dose measurement, it is suggested that 3DVH be used before measurement to predict potential issues due to the placement of the chamber in the CavityPlug™ or MultiPlug™ (if available). However, a failed result should still be investigated at the time it occurs to rule out any other causes. The addition of 3DVH to the PSQA protocol represents a small increase to the workload since the DICOM RT files and CT images for the patient must be exported from the TPS and computed in 3DVH. It is cautioned that reporting DVH metrics for an unnecessarily large number of target volumes and critical structures may create inefficiencies in the workflow, particularly in a busy clinic. Therefore, DVH metrics should be selected for target volumes and relevant critical structures that are most clinically relevant to avoid overburdening staff. In this work, the practicality of introducing DVH metrics into an existing PSQA protocol was investigated for a cohort of HN and brain VMAT patients using 3DVH. 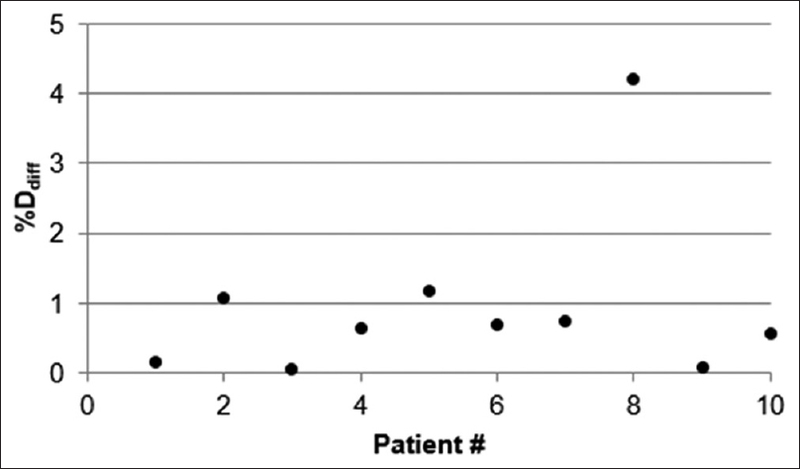 Patient plans were retrospectively analyzed with 3DVH to identify cases where patient dose errors exceed the established action levels and were not originally detected by point dose and gamma index method. In two cases, the point dose action level was exceeded, although it was demonstrated using 3DVH that the cause of failure was attributable to the chamber position in the AC phantom. All plans passed the %GP action level for the 3%/3 mm gamma criteria and passed PTV and OAR DVH metrics. Thus, the results of the point dose measurements and gamma index method were validated with 3DVH. This study has demonstrated the integration of DVH metrics into a VMAT PSQA protocol to provide clinically meaningful results that complement point dose and gamma index measurements. 3DVH should be regarded as an investigative tool that may be useful in diagnosing the cause of failed plans since it allows dose errors to be related to the patient anatomy. The authors would like to thank Dr. Cameron McLucas for his advice and support with collecting and analyzing the data used in this study, Dr. Stan Gauden for allowing us to use patient data collected from the department, and Ms. Nikki Caswell for assisting with getting this project off the ground. Ezzell GA, Galvin JM, Low D, Palta JR, Rosen I, Sharpe MB, et al. Guidance document on delivery, treatment planning, and clinical implementation of IMRT: Report of the IMRT subcommittee of the AAPM radiation therapy committee. Med Phys 2003;30:2089-115. Palta JR, Liu C, Li JG. Quality assurance of intensity-modulated radiation therapy. Int J Radiat Oncol Biol Phys 2008;71:S108-12. Alber M, Broggi S, De Wagter C, Eichwurzel I, Engström P, Fiorino C, et al, Mijnheer B and Georg D, editors. Guidelines for verification of IMRT, 1st ed. Belgium, ESTRO; 2008. Hartford AC, Palisca MG, Eichler TJ, Beyer DC, Devineni VR, Ibbott GS, et al. American Society for Therapeutic Radiology and Oncology (ASTRO) and American College of Radiology (ACR) practice guidelines for intensity-modulated radiation therapy (IMRT). Int J Radiat Oncol Biol Phys 2009;73:9-14. The Royal Australian & New Zealand College of Radiologists (RANZCR), The Faculty of Radiation Oncology (FRO), Australian Institute of Radiography (AIR), The Australian College of Physical Scientists & Engineers in Medicine (ACPSEM). Tripartite Radiation Oncology Practice Standard; 2011. Jursinic PA, Nelms BE. A 2-D diode array and analysis software for verification of intensity modulated radiation therapy delivery. Med Phys 2003;30:870-9. Zeidan OA, Stephenson SA, Meeks SL, Wagner TH, Willoughby TR, Kupelian PA, et al. Characterization and use of EBT radiochromic film for IMRT dose verification. Med Phys 2006;33:4064-72. Hayashi N, Malmin RL, Watanabe Y. Dosimetric verification for intensity-modulated arc therapy plans by use of 2D diode array, radiochromic film and radiosensitive polymer gel. J Radiat Res 2014;55:541-52. Feygelman V, Zhang G, Stevens C, Nelms BE. Evaluation of a new VMAT QA device, or the “X” and “O” array geometries. J Appl Clin Med Phys 2011;12:3346. Nelms BE, Opp D, Robinson J, Wolf TK, Zhang G, Moros E, et al. VMAT QA: Measurement-guided 4D dose reconstruction on a patient. Med Phys 2012;39:4228-38. Carrasco P, Jornet N, Latorre A, Eudaldo T, Ruiz A, Ribas M, et al. 3D DVH-based metric analysis versus per-beam planar analysis in IMRT pretreatment verification. Med Phys 2012;39:5040-9. Coleman L, Skourou C. Sensitivity of volumetric modulated arc therapy patient specific QA results to multileaf collimator errors and correlation to dose volume histogram based metrics. Med Phys 2013;40:111715. Siochi RA, Molineu A, Orton CG. Point/Counterpoint. Patient-specific QA for IMRT should be performed using software rather than hardware methods. Med Phys 2013;40:070601.
International Commission on Radiation Units and Measurements. Determination of absorbed dose in a patient irradiated by beams ofxor gamma rays in radiotherapy procedures. International Commission on Radiation Units and Measurements ICRU Report 24. Bethesda, Maryland: International Commission on Radiation Units and Measurements; 1976. Crowe SB, Sutherland B, Wilks R, Seshadri V, Sylvander S, Trapp JV, et al. Technical note: Relationships between gamma criteria and action levels: Results of a multicenter audit of gamma agreement index results. Med Phys 2016;43:1501-6. Steers JM, Fraass BA. IMRT QA: Selecting gamma criteria based on error detection sensitivity. Med Phys 2016;43:1982. Opp D, Nelms BE, Zhang G, Stevens C, Feygelman V. Validation of measurement-guided 3D VMAT dose reconstruction on a heterogeneous anthropomorphic phantom. J Appl Clin Med Phys 2013;14:4154. Watanabe Y, Nakaguchi Y. 3D evaluation of 3DVH program using BANG3 polymer gel dosimeter. Med Phys 2013;40:082101. Feygelman V, Opp D, Zhang G, Stevens C, Nelms B. Experimental verification of the planned dose perturbation algorithm in an anthropomorphic phantom. J Phys Conf Ser 2013;444:012047. Mihaylov IB, Corry P, Yan Y, Ratanatharathorn V, Moros EG. Modeling of carbon fiber couch attenuation properties with a commercial treatment planning system. Med Phys 2008;35:4982-8. Budgell GJ, Perrin BA, Mott JH, Fairfoul J, Mackay RI. 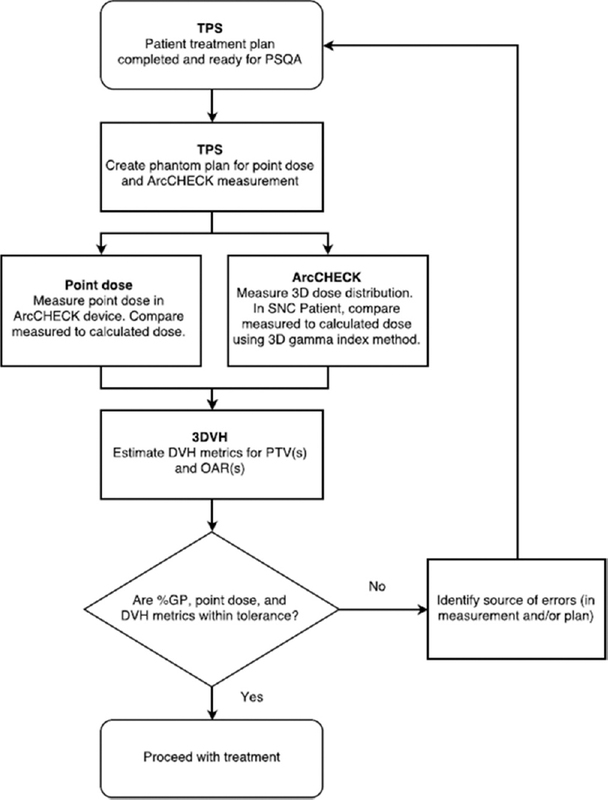 Quantitative analysis of patient-specific dosimetric IMRT verification. Phys Med Biol 2005;50:103-19.